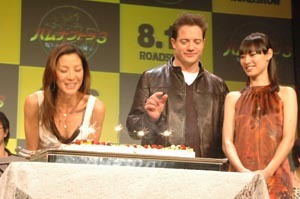 On August 5th, a press conference was held in Tokyo for the Mummy 3 promotion. A birthday cake was presented to Michelle during the news conference, a day prior to her birthday (August 6). Japanese actress and singer Manami Kurose, who performs the Japanese version of the end title song for the film (Japanese title: "Hamunaputora 3"), sang "happy birthday" for Michelle. The cake was decorated with an image of the "Eye of Shangri-La". 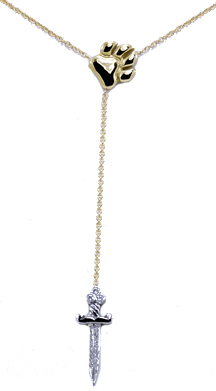 To complete her outfit Michelle wore a dagger necklace in 18kt Gold and Diamonds by Pantera (www.panterajewels.com) retail $1,950 which is a traditional symbol of power especially in ancient Egypt and China very appropriate for the fabulous star of Mummy 3. Co-star Brandon Fraser joked Happy 19th birthday, it's been well done! After licking cake off his fingers, Fraser told reporters that he was an especially happy man. I am the luckiest man in Japan to be sitting between the two most beautiful women in existence, he said as an amused Yeoh and Leong looked on. Ola Danilina has always been known for setting her own trends. Having a deep appreciation for art, nature and ancient civilizations, Ola found a perfect way to bring her passion to life and to share it with others through her jewelry creations. She has experienced many cultures around the world through her modeling career in the late nineties. Having lived in Moscow, Vienna, Monte Carlo, London, Tokyo, Miami and Toronto, she now calls Los Angeles her home. Learn more about Pantera and Ola at their website.